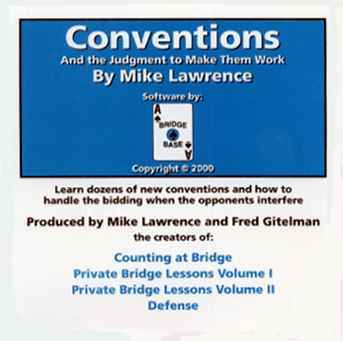 By Mike Lawrence and Fred Gitelman with Fred Gitelman’s newest bridge engine. Conventions is the long awaited software which shows you how to use 90% of the conventions that can be found on the ACBL convention card. The software gives you a brief description of a convention and then lets you bid dozens of hands interactively with the computer. At each junction in the auction, you are given a choice of bids. One is right and the rest are wrong to some degree. Each choice is explained to show you what is good and what is not good about a bid. Each auction will offer some pertinent point to show how the convention can be used. In many cases, there will follow a number of hands showing how the convention works in competition. Finally, for some of these conventions, there are hands to show you how to bid when your opponents use the convention. You will find in here some conventions that have not been written about elsewhere. An improved form of Drury. Using Jacoby 2NT response to a major when your opponents get into the bidding. 1S P 2NT 3H ? East’s two notrump bid shows a balanced game-forcing hand with four or more spades. What should West bid with these hands? There is a ton of information in this disc including the answers to these hands. In addition to the things described above, there are a number of hands to play along the lines of Counting at Bridge, Private Bridge Lessons, Volumes One and Two, and Defense. And, to keep everything in perspective there are some stories about bridge that have not seen print elsewhere. Easley Blackwood told me a story about when he and Charles Goren wrote competing bridge columns. You will find it here and only in here. There is nothing like this product in the world.